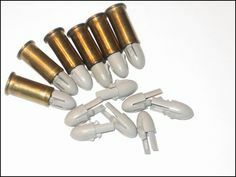 These LiL Babies were used, along with Mattel's Greenie Stickem Caps, in most of the guns brought out by Mattel. @Doot - It wasn't just the bullets that got lost to the "dreaded" vacuum. 1955 Kirby Upright Vacuums. Once sucked in, it is lost forever! What little boy doesn't want to stop the action, so he can pick up his bullets - If he can find them? And, how many of these did Mom's vacume cleaner find?